Do it Naturally! Trimming for barefoot performance horses. Jaime Jackson joined up with Equine Wellness on a great article for performance horses. This article helps you understand which horses can perform barefoot, and other situations that allow you to have a happy barefoot performance horse. Jaime Jackson has answered quite a few questions in this article from Equine Wellness. The first question that everyone asks is: Can horses successfully perform barefoot? His reply was basically barefoot, or fitted with hoof boots , each horse can perform barefoot. Just removing the shoes, however, doesn't mean success right off the starting line. You also need to take into consideration the trim, the diet, and of course training. However, the major consideration or the first step is removing the shoes. Jaime talks about the trim, and he clearly indicates that each different performance horse does not need a different trim based on the discipline. What must be taken into consideration is the horse itself and that a natural trim works for all performance horses. All horses should be trimmed regularly. Naturally trimmed horses, whether at liberty or mounted, are able to move more naturally than when shod. The article also talks about shoeing farrier, vets and trainers that have remained uninformed or misinformed of, or are resistant to the barefoot movement. It is astonishing to Jaime that this group of people and riders still have the "farrier culture" even after many books, journals and articles regarding what shoes do to the hoof. Shoeing weakens the hoof and causes hoof deformity. The horse isn't born with this deformity of weak inferior feet. Weak brittle walls, soft hypersensitive soles, less than optimal circulation can be attributed directly to shoeing. Jaime emphasized that we haven't bred the hoof out of the horse, it is still there. Turn a domestic horse loose into the wild and it will develop the proper hoof form. The hoof is not adapting to the wild, but returning to its' natural state. Even if a horse has had shoes most of his life, he can make the switch to barefoot, his natural hoof is still waiting under the shoe. So if you have a performance horse and wish to go barefoot, you can. Using EasyCare boots can help during the transition, as well as for riding. We have numerous testimonials from barefoot gaited horse owners that have indicated that their horse's gaits have actually improved once the shoes were removed. Our Easyboot Epics have also been used in barrel racing, but the best performance horse story is one in the Old Mac G2. Click here to read that story and then find the September/October 2008 issue of Equine Wellness magazine to read the rest of this great article. Here's some great information for all you Tennessee Walking Horse fans and/or owners. 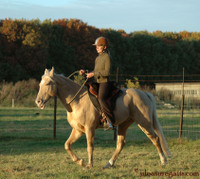 Log on to www.pleasuregaits.com where you will find a world of information about this great establishment that promotes the Tennesse Walking Horse in Europe where,unlike the USA, it is a rare breed to find. That's where Sandra van den Hof, Centered Riding Instructor, comes in. Sandra is one of the few TWH breeders in Europe. Based in Belgium, Pleasure Gaits promotes, imports, breeds, trains and sells TWH's with old bloodlines for which they are originally bred for. Sandra is a strong advocate for humane treatment of horses and has spent most of her life caring for animals in need of special attention or care, and is a strong supporter of the barefoot horse. For complete information on available workshops and clinics, which begin with the introduction to TWH's, Balance and Understanding, to name a few, be sure to visit their website. The beautiful pictures of Pleasure's Pot o' Gold show barefoot and brideless. All of their Walking Horses are barefoot, and as you can see, they gait up a storm! Click on to EasyCare's testimonials for gaited horses, barefoot or using EasyCare hoof boots, for some great reading! A great testimonial for EasyCare's Grips and Easyboots for you to enjoy reading about. 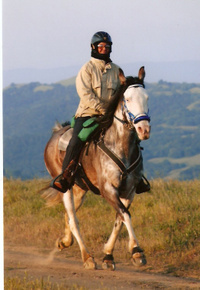 I recently started my two 5 year old Tennessee Walking horses in Limited Distance rides this spring, barefoot booted. 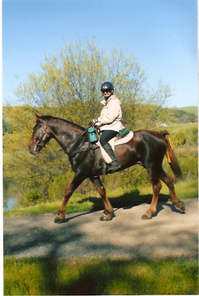 Fizzer is my own breeding, a filly born to a goofy old mare on a steep, rocky, hillside in Mendocino. She has grown up to be a large 16.1 hands, raw boned mare who moves very quickly, with lots of spooking, high action, and fast acceleration/deceleration and direction changes. At vet checks, the vets are agape , as she 'racks out', dragging me along behind her. They ask me if she can do that for speed for 30 miles. I smile and tell them she is a rocket ride. When they ask me about the Easyboots I tell them she has never had shoes. They are amazed. Red is an 1100 pound stallion I have raised from a baby. He has never had metal shoes either. He is 15.1 hands, built like a tank, and wears size 3 easyboot (with dome pads). His first 25 miler was in the heat in the coastal mountains of California. We slid down steep, rocky jeep roads, stepped into the muddy spring grass to graze, and waded knee-deep (he loves that) into cattle-seasoned sucking-mud stock ponds to drink, and he never lost a boot. We put some wear on those puppies, but they never came off. In fact, for the last vet check, I took off all four boots and trotted out that way. Not an ounce of lameness and we passed vet with flying colors.